For Valentine’s Day my wife and I have a tradition of making something for each other. This year I decided to make a chocolate statue of myself. This is the technical tutorial for anyone interested. For my thoughts on whether you should give a statue of yourself as a Valentine’s Day gift, here’s another blog post. 4. Creating a chocolate bar from the mold. Total Cost: $50. 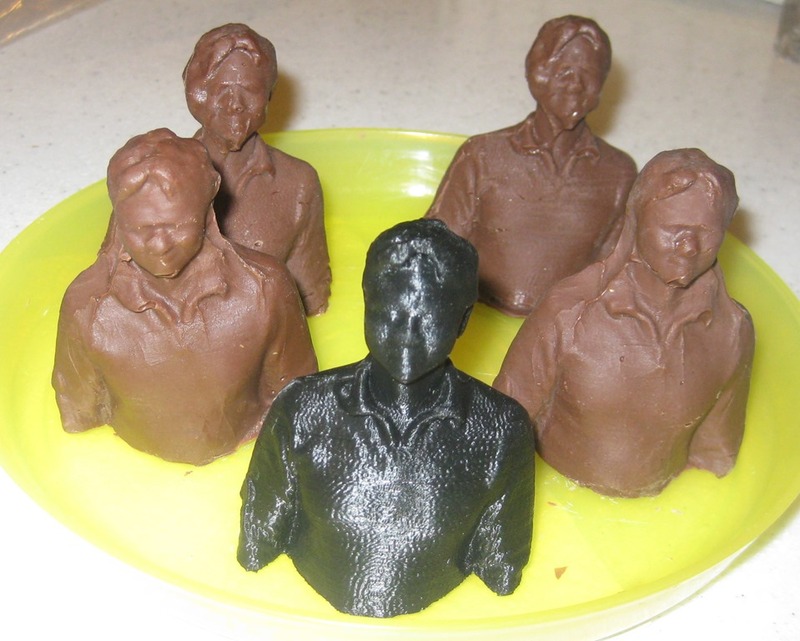 $25for 3D print, $20 for the Amazing Mold Putty, $5 for chocolate. 1. 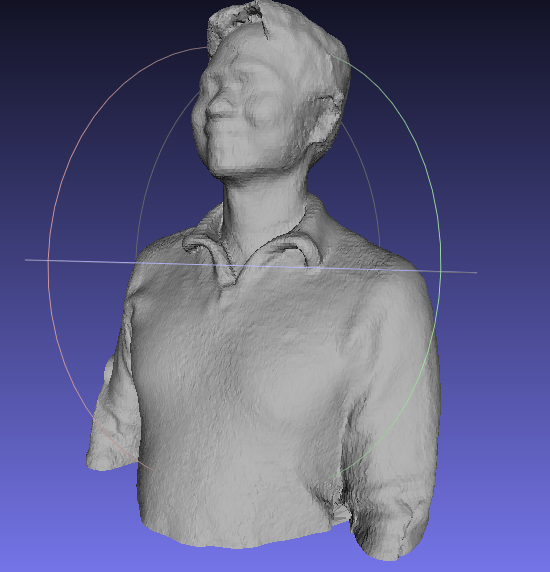 3D Scanning – You need an XBox Kinect. it’s easiest if you have the old school one that has the USB interface. I think the new ones will still work, but you need to get the Power Supply that allows you to plug it into your PC using USB. Then you need to download the Kinect SDK so that it will work with your PC. 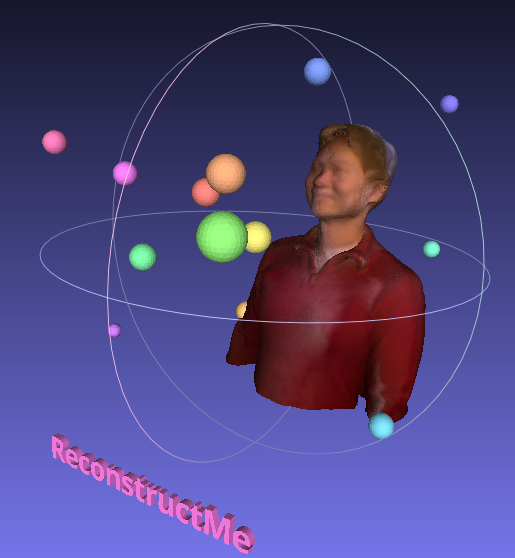 I used ReconstructMe to scan myself in. It has some strict requirements on graphics cards, so make sure that you find hardware that can run it. I needed a friend (Adam Robinson) to scan me in using the Kinect camera while I stood completely still. He just walked around me scanning me up and down. When you use the free version (which I did), there are 3d balls all over the place which is how they 3D “Watermark” the scan. If you’re going to print yourself out, you need to get rid of these watermark balls. If money is no object, then you can just pay for the Pro version of ReconstructMe which will not embed the watermark balls. After I was scanned in, I downloaded another piece of free software called MeshLab. I used MeshLab to convert the ReconstructMe output from a PLY file to an STL file. I found that most 3D printers use the STL format. Meshlab was easy to use to convert the file format, but everything else about it was incredibly difficult. I found another online program at http://clara.io where I was able to upload my new STL. Then I started removing the Watermark Balls. Most of the Watermark balls were easy to remove. There were a few that were embedded into my body. Removing those were a bit like removing tumors. I wasn’t able to remove them completely smoothly, but most of it was gone. I figured I could sand down the 3D scan if it was too obtrusive. Then I exported and downloaded the STL file from clara.io. I re-opened it MeshLab, then scaled it so that I was about 3 inches tall, then re-saved. Next I used a service called NetFabb where I waterproofed the model. Apparently, this is required before you can 3D Print anything. A few minutes later, NetFabb emailed me with a link where I could download the processed model. Now, I can use this model to make a 3D print of myself. 2. 3D Printing – I did a lot of shopping around for 3D print services. There are a whole bunch available and they all offer different materials. It seemed like ceramics was the cheapest. However, all the companies had about a 3 week lead time on ceramics. Most companies had a 2-3 day lead time for plastics, but they were quite expensive. For a 3 inch print of me, we were looking at $40-$60… I was a little sticker shocked and kept searching for other options. That’s when I found makexyz.com. They were a directory of a whole bunch of mom/pop 3D printers who would print out models for you. I found several in the Seattle area that would make a print at 25 cents/cm^3 which was super cheap. I picked a company called ObjectDefi 3d printing. I uploaded my STL. I got a quote the next day for around $25. I told him to go for it. By the time I asked where I should pick it up, he had already printed and shipped it to my address. The print arrived 2 days later. 3. Negative Mold – Once I received the plastic statue of myself. 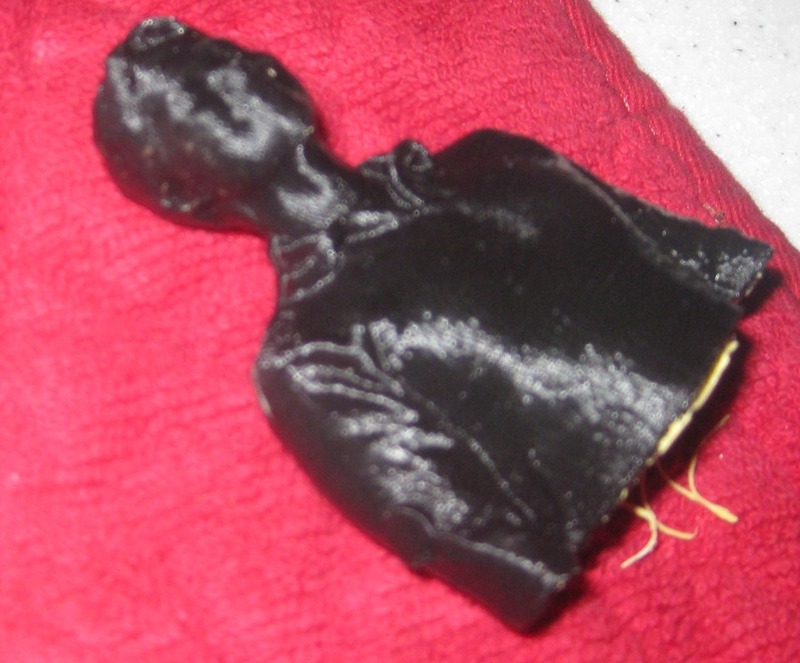 I used the Amazing Mold Putty to make a mold of myself. The putty came in two bottles. I had to mix an equal amount of putty from each bottle, then I had a couple minutes to cover my plastic statue before it started to harden. I ended up making two molds. The first mold, I covered my statue entirely, but then wondered if I got air bubbles inside. 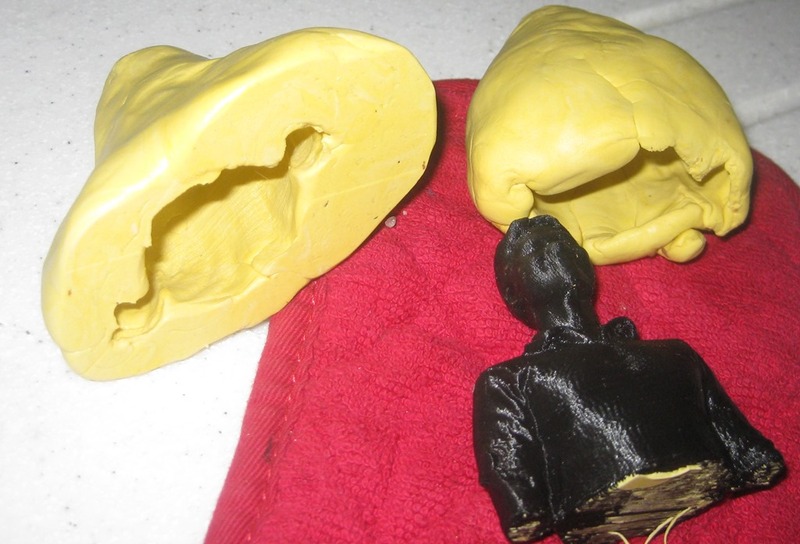 I ended up removed the mold, re-kneading the putty then trying to cover my statue a second time. But, I think I took to long and the putty was already starting to retain its shape. it didn’t want to stick to my statue anymore. I was pretty sure there were going to be bubbles between the statue and the mold. I waited about an hour for the mold to harden, then I made a second mold. The second time, I worked quicker and carefully rolled the putty down from top to bottom to avoid any air bubbles. After about an hour, I cut the mold open with scissors and slipped out the statue. Once I got home, I filled a pyrex measuring cup with 1 cup of chocolate bars (1/2 brown, 1/2 white). I then heated it in the microwave for about 30 seconds on 50% power. I did this about 5 times (for a total of 2.5 minutes.) I stirred it up with a spoon and it was a nice, smooth liquid. The chocolate was still cool to the touch. I put some rubber bands around the molds and placed them inside cups to hold them upside down. I poured the chocolate in the mold. Once I filled up the head section, I used a chop stick to stir around the chocolate to remove any air bubbles. then I filled the remainder of the mold. I put the mold in the refrigerator for a few hours. When I took them out, the chocolate was completely solid. I took off the rubber bands and peeled the silicone putty off of the chocolate, pulling out the statue. Chocolate statues are done. My first mold did indeed leave some air bubbles in the mold. The chocolate statues that came out of that mold gave me jar-jar binks ears. The second mold also gave me some deformities on the right side of my face, I think that might have happened while I was cutting open the mold. Fun project. Not too expensive if you’ve got a kinect sensor. The kids might be next. Some friends at work suggested making a chess set out of co-workers… Actually, when I told some people that I’m making a chocolate statue of myself, I got all kinds of interesting suggestions, most of which is not appropriate for this family blog… So, I’m sure there are a lot of ideas out there and I wish you well! If you do decide to try this, please share what you make (if appropriate)!